Brazil's National Museum stands, gutted by fire, in Rio de Janeiro, Brazil, Feb. 12, 2019. Overnight Sept. 2-3, 2018, Brazil's National Museum, north of Rio de Janeiro, was ravaged by a massive fire. Latin America's largest natural history and anthropology museum held more than 20 million artifacts and 530,000 titles. File photo of Venice's world famous Fenice opera house which was destroyed Jan. 29, 1996, following a blaze which left it a smouldering hulk. 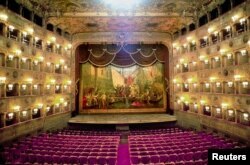 In 1996, Venice's celebrated opera house La Fenice was gutted by fire.With its near-perfect acoustics, La Fenice, opened in 1792, was one of the most beautiful opera houses in the world and one of the most famous in the history of opera. 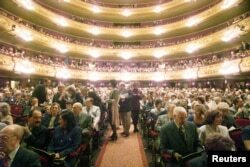 A full house prepares to listen to the Spanish opera star Montserrat Caballe during her first recital at Barcelona's refurbished Liceu theatre Oct. 15, 1994. In 1994, the Gran Teatre del Liceu, Barcelona's world-famous opera house was destroyed by fire. One of Spain's cultural jewels, the 150-year-old theater was gutted in a blaze in which only the foyer and the horseshoe arch over the auditorium were left standing. It has since been reconstructed. 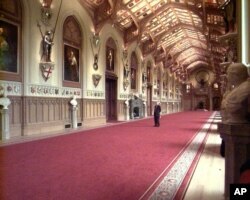 A visitor looks at the ceiling in Windsor Castle's St George Hall, Nov. 17, 1997. Restoration work costing 37 million pounds ($63 million caused by an extensive fire Sept. 9, 1992. A major fire at Windsor Castle, west of London, on Nov. 20, 1992, destroyed the northeastern part of the royal site, the queen's weekend residence. Nine of the rooms were left unrecognizable by the fire, which started in the former Chapel Royal when a lighting projector too close to a curtain started the blaze during routine maintenance work. It took 250 firefighters working 15 hours and pumping more than 6.5 million liters (1.6 million gallons) of water to bring the blaze under control. The restored "Vijecnica" (city hall) is seen in Sarajevo May 8, 2014. Sarajevo's City Hall, a stately neo-Moorish edifice marked by the violence of two 20th-century wars, has returned to its old glory after being destroyed by Serb shelling. Bosnia's 19th century National Library was destroyed in the war-time siege of the city of Sarajevo, overnight on 25-26 Aug. 1992. Only some 10% of its resources were saved from the resulting fire. Tobias Richter, Director, poses in the foyer of the Grand Theater in Geneva, Dec. 9, 2011.